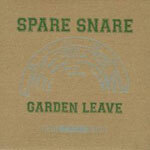 Ostensibly this is a review of Spare Snare’s latest album, Garden Leave, their sixth, seventh or eighth even depending on whether you count the compilation Love Your Early Stuff or the Japanese only Disco Dancing which compiled their first three singles for ‘the boys and girls of Japan’. But we’re not going to be pedantic or elitist here are we? For me, Spare Snare has never been about elitism or exclusivity but instead have always been an inclusive and communal experience. They’ve always been about pop; it’s just that they’ve chosen to do it their own way. And I admire them for that – for their lack of compromise, the refusal to flog themselves to death in an attempt to forge a ‘career’ in music and they way in which they make records that they care about. But it isn’t just that; they make records that other people care about, records that I think are special and that have a place on my stereo and in my heart. Dundee is a small place and like most small places everyone seems to know everyone and have an opinion on everyone. Quite often these opinions are widely inaccurate and based upon strange assumptions and preconceptions. 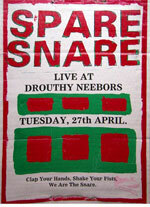 Spare Snare confuse people around these parts. The careerists love and hate them. The debut album Live At Home put the band and city on the map as they (quite rightfully) gained a lot of acclaim. They gigged frequently, toured the States, garnered good press, recorded sessions for John Peel and most people in other bands looked on with a mixture of admiration and envy quite possibly thinking to themselves ‘I quite fancy a bit of that’. Some of us thought perhaps people will stop looking at Dundee as a backward place whose last claim to fame was Danny Wilson, a decade before. However, the careerists were appalled. Jan had two strings on his guitar, they played simple, buzzy pop songs, swapped instruments with gleeful abandon and their gigs had a joyous feel to them. They made no concessions to hipster-dom, there were no attempts to project coolness and yet they were/are the coolest, hippest band around. The only fun in town to borrow or steal from Josef K. All those other bands straining away to jump on the latest bandwagon, practising their chops (or at least Noel and Liam’s chops) and hoping to jump on the Brit Pop bandwagon, praying they could be the next Oasis but not even being the next Gyres, Whiteout or Octopus. And then along come this bunch of inept shamblers who had totally wrong footed them. They had paid their dues and yet were being turned away from the party unceremoniously, left only with their talk of ‘showcase A & R gigs’, ‘major label deals’ and desperately seeking the next bandwagon to jump on twelve months too late. At least none of them took four strings off their guitars; the hegemony of ‘proper’ music was too strong for that nonsense. Then there were those who were bewildered at the fact that the band never seemed desperate to make a career out of it all post Live At Home. Sure, they toured with kindred spirits The Delgados, Jan undertook a solo tour of Japan but then the second album appeared. Westfield Lane was ostensibly a solo effort and wrong footed a lot of people. Its beautiful card sleeve contained a photocopied map of the Perth Road area, home to Jan. On the other side credits included the ‘Futurama Two String Electric Guitar’ and ‘Published by Deceptive Music/EMI Publishing Limited’. I’m sure there was no intention to rub further salt into any lingering careerists following Spare Snare, it’s just these are the things you list on sleeves and Jan is nothing if not a keen pop fan. Westfield Lane is a treat, eleven scuffed up songs, less immediate than its predecessor but well worth exploring. Sure, they could have thrown together Live At Home part 2, toured themselves into the ground and signed a deal before being squeezed through the industry sausage machine in a barely recognisable form but they chose not to. They expressed ambition in their songs, records and artwork and stuck with the cottage industry that is their own label Chute. Complete control is not an abstract theory but a fact of life for Spare Snare. Some folk may see this as failure: lo-fi, indie-shmindie, under achievement. I see this refusal to compromise as an act of bravery, one which is wholly vindicated by the fact that their latest record is as essential, exciting and joyous as their first, over a decade later. Sure, I’d have loved more gigs. I’m as excited as a kid at Christmas or a teenager on a first date at the thought of seeing them live on December 28th. And as nervous! As Chris says in his piece, I also urge you to go and see them. I never saw Spare Snare coming despite knowing all the main characters. I first saw Jan almost a decade earlier at the first gig I ever attended. 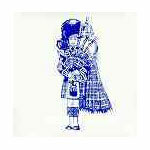 It was an outdoor concert held in Baxter Park, a Victorian municipal park in the cities Stobswell area. I could see the stage and the first house I’d ever lived in when I was born. Odd how little distance I’ve travelled I thought then and sometimes I feel the same. Most of the bands that day were simply awful, one or two were even glammy-punk acts, a decade or so too late. This one band were a lot different. Let’s Evolve were a duo with a distinct New Order feel to them. Despite seeming more shy and inhibited they displayed a nice line of off-kilter pop hooks and Jan had a charismatic presence. I decided that day to start my own fanzine and to interview Let’s Evolve. But by the time I did so Jan had departed and been replaced. Another band I featured in my first fanzine were the Sandflowers who had Alan Cormac among their number. Alan designed the cover for issue two. After the demise of Sandflowers, Alan joined up with Barry Gibson in Muppet Mule. Paul Esposito worked upstairs in the record shop 23rd Precinct alongside Brian, the other half of Let’s Evolve. 23rd Precinct was a good meeting place and far too close to the University so consequently it became a place where I spent far too much time and money. Anyway that was Spare Snare Mk. 1. Jan’s pop career had, over the years, amounted to a weekly club night, Chopper, and occasional performances, the most memorable being an electro pop cover of an Abba song in the Westport Bar wearing what looked like a dunces hat. Oh, and he’d released a single, ‘Shandy On The Rocks’ under the moniker of The White Heather Club. I’m not sure how to describe that one but let’s just say I didn’t think I’d heard the future of pop in it. Little did I know that the next thing I would hear would be the fantastic ‘Thorns’ 7”. Then I saw them live and I was hooked. Since then members have came and went as have bands but Spare Snare have kept on releasing wonderful records at their own pace. How far we’ve come over such a distance and yet some things never change. Garden Leave represents change and stability. It’s lyrically and sonically clearly Spare Snare. Yet the press release mentioned country and folk influences and I began to feel slightly nervous. Like meeting a friend you’ve shared a lot of experiences with in the past, both highs and lows, but have lost touch with, I approached it nervously. Tentative and anxious thoughts overwhelmed me. What if we don’t get on, if we’ve grown too much apart? Imagine I dislike it or feel embarrassed? Should I leave now and just enjoy what we had together before? Had it come to this that I’d invested so much of my past in music that I was scared of facing Spare Snare in the present? So get on the phone and sort it for afterwards. The fuzz bass and driving percussion breaks down into a quieter passage before what sounds like a trumpet gives it a haunted edge then it leads straight into the brooding ‘Just Let Go’, an impossibly sad sounding song with its resigned, sweet slide guitar and regret filled, melancholy vocal. There is some subtle but great interplay between the instruments and a lovely instrumental ending. It’s the first song to creep past the three-minute mark; indeed all the songs are exercises in economy with no spare fat or additives in sight. ‘Volume For Poetry’ is prettily eerie. The poet Anne Stevenson is sampled reading over a gentle instrumental, which really works to enhance her evocative, rich voice. This is particularly successful as she introduces a series of poems based on letters written in the nineteenth century informing us that ‘none of these people are living’. The submerged sounds and voices in the music give it a haunting, ghostly feeling. ‘Trees And Horses’ mixes folky picking with Eastern drones and an impossibly high vocal. ‘In The City’ begins with what appears to be a treated, pre-programmed beat, building up from the most rudimentary of musical sounds with a clipped bass line and discordant vocals to fashion something inventive and new. It manages to sound fragile, fractured, discordant and defiant at the same time with curious backing vocals deep down in the mix. What initially sounds messy and throwaway soon reveals itself to be a cleverly layered and structured song that has a passing acquaintance with an earlier Spare Snare sound. Can I have you back now? The delivery is quite dark, the final lines and discordant keyboards seem to combine to offer a sense of (misplaced) resolution but the final song ‘Grow’ is more positive. It’s very intense and uplifting, both musically and lyrically. The lyrics talk of stepping back from unwinnable fights (MacDonald’s is alluded to in the opening line) to make a space where ‘I’ll cut the grass / And grow myself’. If this sounds a little hippyish then don’t worry, this is still a ‘punk-pop’ album. ‘Grow’ is a lovely finale to an album that can often feel pretty dark and intense though there is a lot of light and shade spread over Garden Leave’s twelve songs. From days out in the country (‘Field Trip’) to settling down there (‘Grow’) Garden Leave makes quite a journey in its short playing time. The album has a really organic, raw feel to it, there are moments of discord and brittleness but it is also warm, intimate and beautiful. At times you feel as though you are listening to someone’s most private thoughts, an unsettling internal monologue,, at others you enjoy the story unfolding. Not one song sounds out of place, nor do they ever outstay there welcome. Quite often I find myself thinking the songs are too short and, coming out the other side, take a deep breath and jump right back into the world of Garden Leave. This is another accomplished superb record. Bigger than the Beatles? I don’t care and I suspect Spare Snare don’t either. All I care is that they have been one of my consistently favourite bands for more than a decade and they could be yours as well! How far we’ve travelled together and over such a distance. Hopefully some things will never change.